A unique long term project that aims to achieve much more than just to bring high quality entertainment to the public. The success of JakArt can be measured by the magnitude of both the positive and critical attention that JakArt@2001 generated, the continuing interest and support of government and non-governmental organizations and associations, foreign embassies, artists, the business community, concerned citizens, the media, etc., the incredible enthusiasm of the hundreds of volunteers involved, the many dialogues that it has started, and by the immense and memorable pleasure derived by thousands and thousands of our fellow citizens. Whereas JakArt@ 2001 as a first time event was in many respects spectacular and exhilarating, precisely designed to introduce a new idea and to demonstrate a possible format that this could take, JakArt@2002 intends to concentrate on the more mundane and less exciting task of developing a vehicle, an organization, that will be able to carry this vision well into the future. Building upon the impressive achievements of JakArt@ 2001 will continue to foster and strengthen links already established and will seek to explore new avenues and construct new bridges. Areas of particular concern that JakArt@2002 will focus on are: the importance of CREATIVITY in our social, economic and cultural activities, Human values and Freedom of Expression, intercultural and interdisciplinary artistic collaboration, exchange and comraderie, audience building, and the establishment of a forum to empower people to take responsibility for the the development and implementation of their own citywide, month-long festival in celebration of Jakarta's birthday. To this end JakArt@2002 will resemble more an intensive Cultural and Educational Campaign to disseminate as far and as wide as possible the above mentioned aims and ideas, and to encourage a greater participation of the population at large, both as hosts and as active participants. 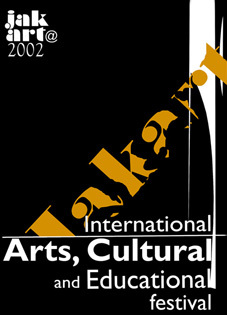 JakArt@ 2002 intends to share and promote the wealth and diversity of our Cultural Heritage, while continuing its drive to expose and fan contemporary artistic development.